We offer a selection of 22 tastefully decorated King and Twin Studio Units, 1, 2 and 3-Bedroom Apartments with modern furnishings. All bookings receive FREE access to our Airport Shuttle (Weekdays 7am – 8pm / Weekends and Public Holidays 8am- 8pm), guest laundry, newspaper, free unlimited high-speed WiFi as well as park and fly (subject to availability). King-size bed, wet floor shower, 32 inch flatscreen TV, microwave oven, toaster, tea and coffee-making facilities. Twin beds, wet floor shower, 42 inch flatscreen TV, microwave oven, toaster, tea and coffee-making facilities. King-size bed, microwave oven, 42 inch flatscreen TV, toaster, tea and coffee-making facilities. Twin beds, microwave oven, 42 inch flatscreen TV, toaster, tea and coffee-making facilities. King-size bed, spa bath, separate shower, 42 inch flatscreen TV, microwave oven, toaster, tea and coffee-making facilities. King-size bed in bedroom, kitchen/lounge, 42 inch flatscreen TV, microwave oven, toaster, tea and coffee-making facilities. King-size bed in separate bedroom, twin beds in lounge, 42 inch flatscreen TV, 2-ring ceramic cook top, microwave oven, toaster, tea and coffee-making facilities. King-size bed in one bedroom, twin beds in other bedroom, kitchen/lounge, 42 inch flatscreen TV, microwave oven, ceramic cook top, toaster, tea and coffee-making facilities. King-size bed in one bedroom, twin beds in second bedroom, kitchen/lounge, 42 inch flatscreen TV with 32 inch flatscreen TV in king bedroom, 2-ring ceramic cook top, microwave oven, toaster, tea and coffee-making facilities, spa bath and separate shower. King-size bed in main bedroom, twin beds in other bedrooms, one bathroom, kitchen/lounge, full oven with 4-ring ceramic cook top, fridge/freezer, microwave oven, toaster, tea and coffee-making facilities. Large 50 inch flatscreen TV with 32 inch flatscreen TV in king bedroom. Double-glazed windows, non-smoking, 42 inch flatscreen wall TV, built-in wardrobes, ironing board/iron, electric blanket, hairdryer, in-room heating, Sky TV, FREE unlimited high-speed WiFi, tea/coffee, toaster, microwave, dining table/chairs, ensuite with complimentary Eartherapy guest amenities, and daily housekeeping (included in rate). Our FREE shuttle is available for guests arriving and departing on flights during the hours of 7am until 8pm weekdays and 8am until 8pm during weekends and public holidays. Outside of these hours we can arrange a taxi at a special discounted rate for guests departing from our motel only. On arrival at the airport, and once you have come through customs and collected your luggage, please contact us on our freephone 0800 200 529 and advise us of your arrival. Once you have done this please make your way to the top of the domestic terminal and exit through doors numbered 1 or 2. Please then wait here until the van arives. We will be in a silver van signwritten with Airport Palms Motel and green palm trees. Please acknowledge us with a wave. 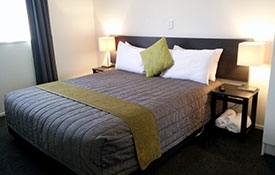 Airport Palms Motel Ltd is a New Zealand business. All transactions are billed in New Zealand dollars.